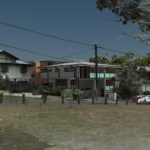 Jensen Bowers were successful in securing a Development Permit for a 3 storey Multi Unit Development in Camp Hill, a middle ring suburb of Brisbane within the Low-Medium Residential Density (2-3 Storey Mix) Zone. Of note was Jensen Bowers’ ability to achieve the maximum yield for the site by successfully contesting a performance outcome for an increase in building height. The final development outcome provides a balance between achieving a successful infill development while maintaining residential amenity and contributing to the architectural fabric of the area. Jensen Bowers was able to demonstrate this with a 3D visual analysis of the site and surrounding neighbourhood. 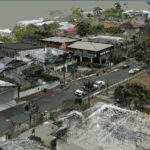 This was achieved by undertaking a reality capture of the site and surrounding area and then inserting the proposed development 3D model to assess the potential impacts and analyse the mitigation measures virtually. Brisbane City Council as the assessment managers utilised this tool for both analysis and consultation to demonstrate how the proposal did not impact upon neighbour’s amenity and contributed positively to the streetscape character. As a result, zero public submissions were made against the project. Other aspects of the development include well designed modern apartments in a visually appealing architecturally designed building. The project was designed by VSA Design.